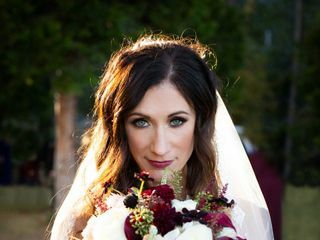 Meghon and her team were the perfect florists for our Tahoe wedding. Our wedding guests could not stop complimenting how beautiful our wedding décor was, and it is all thanks to Love and Lupines. They not only provided the most beautiful flowers to perfectly match our colors, but they also had such unique décor and signs that they brought up and set up themselves, as well as cleaned up. It was beautiful from start to finish and Meghon and her team are the best around. Beautiful Floral and Best Person to Work With! Meghon was amazing to work with and I loved everything she did for our wedding. I would highly recommend her a million times over! Working with Love and Lupines was an absolute dream! Meghon was fabulous to work with from the beginning. She sat down with us over coffee and it felt like we had known here for years. After our initial meeting, she sent us an inspiration page and she nailed it on the first try. Love and Lupines is extremely creative and they use a custom approach to everyone they work with. Looking at their social media pages, you can tell they are not a cookie cutter operation, but really listen to their clients. We can't recommend Love and Lupines and Meghon enough! Meghon was such a dream to work with! She created a beautiful floral design to elevate our vision. My bouquet was gorgeous - I wish I could keep it forever! And the charm attached to my bouquet was such a sweet, personal, and unexpected touch! She was completely willing to work within my budget and I would hire her again in a heartbeat! Meghon is absolutely amazing! She worked with our budget and brought our vision to life. Highly recommend - 5 stars!! Love and Lupines (Meghon) is anything but phenomenal! The detail, the vision, the extra care she put into our wedding flowers was BEYOND expectation! I cannot believe we lucked out and were able to have such gorgeous flowers at our wedding. Do not hesitate in booking Love and Lupines! Meghon is very easy to work with and clearly has a great eye for floral arrangements. 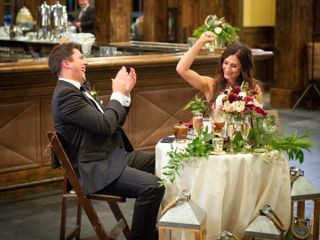 We are SO happy to have booked her for our wedding and could not have been happier! Absolutely wonderful thank you thank you!! 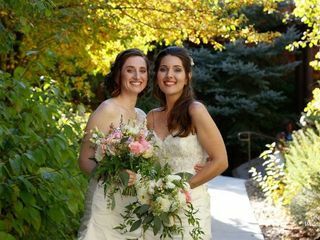 We adored our flowers -- both the brides, myself and my wife, loved our bouquets so so much. We didn't want to throw them to the crowd because we were so happy with them. We threw one and kept one for ourselves. The centerpieces were amazing. Everything was gorgeous and delivered so fresh and on time and arranged perfectly. Meghon of Love & Lupines is AMAZING!! Bear with me as I might gush a little here, but I could not be more thankful to Meghon for how much she brought to our special day. She was so easy and great to communicate with - super speedy replies and so easy to bounce ideas off of. I sent her a few pictures of the style I was interested in, she got it right away and ran with it and I am still baffled by the gorgeous displays she came up with. One week before our wedding I sent her a picture of the "arc" I had asked her to provide flowers for, turns out my terminology was off and in fact it was a pergola she was needing to style. But Meghon didn't sweat it in the least, honored the prices we had discussed and created the most breathtaking arrangement for us to say "I do" under. Every detail she brought to our wedding I loved SO MUCH. 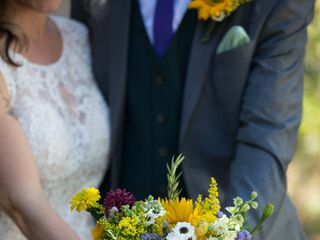 Each bouquet had such detail and beauty, my own brought me so much comfort and peace that day with it's calming sprigs of mint, lavender and chamomile and bright, gorgeous flowers. She sources her flowers from local CA farms and all of them lasted beautifully all weekend (and I kept and shared many of the arrangements for almost 2 weeks!! Super fresh, high-quality flowers!) And this woman is so awesome, after she finished adorning all of the tables with gorgeous arrangements, providing us with perfect bouquets, boutonnieres and flower crowns, she went above and beyond and helped my wedding coordinator set up the rest of the decorations just out of the generosity and kindness in her heart. She took all of the little items I had gathered for our sweetheart table and created the most SPECIAL and darling display for the new couple to sit with and helped pull together last minute decorations. Meghon is super super talented at what she does and we are so thankful we found her for our wedding! Meghon was great to work with and everything was beautiful. Meghon nailed it!!!! I just recently used Love & Lupines for my wedding, and i couldn't be more happy! Everything was absolutely perfect and was exactly as i had hoped! Meghon was so easy to work with and really paid attention to every detail. She asked me use Pinterest to help get pictures of what i liked. This was such a good recommendation, because it allowed me easily show her my style and different types of flowers that i liked. She was able to replicate my favorite items for flowers used during the ceremony, table settings, boutonnieres, and bouquets perfectly. She gave me three different pricing options, with item each detailed and broken down. She was very responsive to my questions, and tailored my order specific for what made sense for us. I would highly recommend Love & Lupines as your vendor for flowers. Thanks Meghon!!! I found Meghon during my search for a florist for my Olympic Valley wedding because lupines are one of my favorite flowers. From the moment I talked to her on the phone, I knew she was OUR FLORIST. She's an enthusiastic, sweet person who seemed genuinely excited for my bouquet. She's a wizard - she even surprised me with the miniature pineapples I wanted! My bouquet was even more beautiful than I'd imagined, and she somehow stuck a deer antler in there, just like I wanted. Even when I was bumbling with vague flower descriptions, she knew exactly what I was going for. Throughout the many back and forths over the months, she was awesome and professional. On the day of the wedding, she dropped off my bouquet at my air bnb right on time with smiles at 6 in the morning. Then she went to drop off flowers for the arch and stayed to help set up even though she didn't have to. Our centerpieces at the reception were AWESOME, she'd put in cherry tomatoes and blackberries! She's just an amazing, excited person to have around on your wedding day. I'm so glad I went with her! Thank you, Meghon! 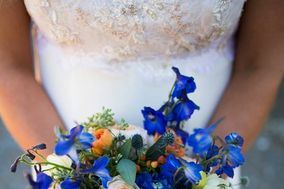 We used Love and Lupines for our wedding at Sugar Bowl, CA in July 2017. Meghon’s flower arrangements were absolutely stunning and so creative! She nailed our vision for the color scheme we wanted and she even allowed us to incorporate some of our own art into the pieces! Not only was she super easy to work with, professional, and organized, Meghon went above and beyond what we asked for and delivered the most gorgeous décor alongside the flowers. We would recommend using her for flowers—her work is amazing and will not disappoint! Love & Lupines (Meghon Shrewsbury) provided all the flowers and arrangements for our daughter's July wedding ceremony, cocktail hour and reception (3 venues) at The Resort at Squaw Creek. L&L/Meghon did a fantastic job. Everything was beautifully made with very fresh florals, etc., timely delivered and properly displayed. Meghon even provided beautiful, hand - made birch sculptures to soften the beverage bars and, separately, for displaying personal photographs at the reception. 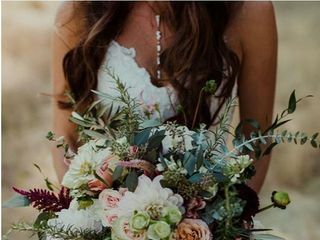 It was exactly as our daughter (and the MOB) had hoped, working with Meghon to select the particular florals consistent with the desired theme, look and feel for this summer Tahoe wedding with 200 guests. Pricing was very reasonable, with no add-ons or issues regarding finances at all (a great relief for those FOBs dealing with “George Banks’ Syndrome”). We had to convert a large “corporate” ballroom into a rustic Old Tahoe atmosphere and Meghon’s insights, artistry and passion really helped make that dream happen. 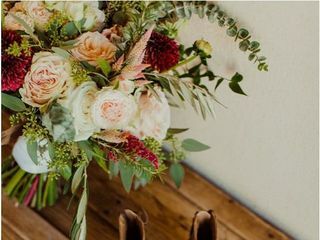 She even went the extra mile at the end to come up with some additional floral displays to really assure the overall ambiance the bride and family desired. She was at all times exceedingly professional and a true joy to work with. We highly recommend Love & Lupines, and are very grateful and fortunate to have had them for our daughter’s beautiful wedding. I absolutely loved my flowers, they were beautiful. They were the best part of the wedding. Meghon Shrewsbury at Love and Lupines did a fantastic job with our wedding flowers. She was able to figure out exactly the look we wanted from our very vague initial descriptions. She stayed cool and calm throughout the whole experience, particularly in dealing with many different family members who wanted to weigh in... And most importantly she delivered the most beautiful floral arrangements! We received so many compliments throughout the night, particularly on the chuppah. Our chuppah was my favorite of our wedding decorations. It was absolutely beautiful and I wish I could have taken it with me. I also requested extra flowers so my friends and I could make hair pieces and Meghon responded without hesitation and provided all the materials we needed to make it work. Meghon was such a pleasure to work with and my absolute favorite of all our wedding vendors :) Thank you!! First of all, I contacted Love and Lupines and offered to write this review because I was so pleased!! I needed to plan flowers for my daughter's wedding from long distance and am NOT an experienced event planner. Also I don't like to take chances with important things like a wedding. Meghon of Love and Lupines was local to Sugar Bowl in Norden, CA,, the venue for our daughter's wedding, and had been the wedding coordinator there. She had a good reputation but we were skeptical. She agreed to make us a sample table box to our specifications, and present it at our tasting. From that moment, I knew we had the right person. The flowers were exactly what we described, lush and full not skimpy, and absolutely beautiful. We talked over some color tweaks, and some extra plans for the table, aisle and chuppa. Still I didn't know for sure until Friday before the wedding. I met Meghon personally decorating the chuppa with gorgeous flowers and eucalyptus. I knew we were going to be happy. 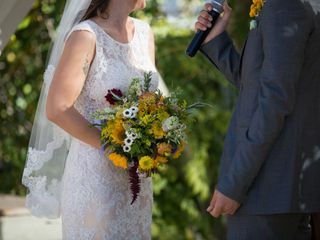 The Saturday of the wedding, the aisle was marked by lovely mason jars full of gorgeous colorful flowers and greens hanging from shepherd's hooks. The table boxes were exactly like the sample and absolutely memorable!!! The chuppa was over the top--magnificent and much more than I had expected or dreamed about. There was no need for other decorations since the flowers perfectly complemented the natural rustic setting. Meghon placed some candles for us around the tables and we were finished. Meghon "got" us and the feeling we were going for. Her price was competitive; but most important is that the value we got for our money was outstanding. People commented that the flowers were the most beautiful they had ever seen at a wedding. We were delighted, but I was sad to leave the still-beautiful flowers after a magicall weekend. I am drying two bouquets at home as a special memory. THANK YOU!! Meghon was super creative and made unbelievable arrangements within the budget that we were working with. She worked with our wedding planner and venue seamlessly, we didn't even have to see her on the wedding day (but everything was perfect!). I would recommend her work to anyone! Meghon was amazing to work with. She made my vision a reality and it couldn't have been more perfect. She is an incredibly nice person and so easy to work with! My wedding wouldn't have been the same without her! Meghon was recemmended to me by everyone I asked who my florist should be for my wedding. I asked around about local vendors and everyone said no doubt Meghon (Love and Lupines) would be their top pick! Meghon with Love and Lupine was the perfect florist for our Northstar wedding! She literally thinks of everything! Our flowers were perfect and the colors were amazing. I would say Meghon went above and beyond with making sure everything was perfect for our special day. She will take the time to work with you to make sure your wedding flowers are exactly what you want and has tons of helpful ideas! She delivered flowers and filled the venue with extra flowers for spots I wouldn't even think of! I have already recommended her to friends in the area for their weddings! I would say Meghon and her husband (Chad) Northstar Village's Tavern 6330 head chef are quite the dynamic duo when it comes to weddings! Meghon did an amazing job!! From the beginning she was a pleasure to work with, very professional and quick to respond. She had no problem adjusting a few flowers to things we liked better and still working with our budget. All of the bouquets, boutineres, and corsages looked absolutely stunning. We were extremely pleased. I know summer is wedding season but even though Meghon was busy she made me feel like a priority. They even delivered all of my flowers to my venue the morning of my wedding so that I didn't have to go pick them up!! Great service, I would recommend them to everyone. Meghon was wonderful to work with. She was able to work with me on floral pieces that were definitely out of the box! They blended in with the outside setting so beautifully. She was easy to get in contact with and worked with the hotel seamlessly. Meghon was responsive and attentive! I could not have asked for a better local florist. I sent her pictures of what I invisioned and she helped bring everything to life. I originally planned to have a "fun" bridal bouquet DIY with my 9 bridesmaids but I had a felling it was not going to work out and asked Meghon to arrange them for me. She agreed without a question. And her arrangements. Wow! Absolutely stunning. Everyone was swooning. I thought for a minute I was going to have trouble finding my way down the isle because I wasn't sure i'd be able to stop staring at my bouquet. I'd recommend Love and Lupines to any bride or groom! I feel so lucky to have found Meghon. She is seriously such a wonderful person to work with. She totally accomplished my vision for floral and helped me stay within my budget. All our arrangements were absolutely stunning!! She also put a personal touch on my bouquet (wedding date charm). Her wood pedestals were also a wonderful touch in accomplishing our vision. It was such an absolute pleasure working with Love & Lupines! Meghon made our day extra special by really bringing the vision for our wedding to life. Seeing my bridal bouquet for the first time brought tears to my eyes! It was exactly what I pictured in my head and she was able to create it in real life. Meghon was extremely responsive, so wonderfully easy to work with, and as the big day approached, very easy going about a few changes that arose. My husband and I have nothing but the best things to say, and have already been recommending her to our other engaged friends looking to get married in the most beautiful place in California! Meghon was truly a gem to work with, and we appreciate all the work and love she put in to our florals, it made our day all the more special. Thank you a thousand times over!